Many drugs are absorbed by cell membranes. Tests on human cells showed that certain prescription-only anti-inflammatory drugs, some of which are being tested as treatments for Alzheimer’s disease, unexpectedly increased the range of proteins cut by an enzyme in cell membranes. Since this enzyme — and others that reside in cell membranes — control the activity of many important proteins, it is hard to predict what effects its nonspecific activity might have in humans. Although the drugs tested are FDA-approved, if they are taken at higher doses or for longer periods of time, these drugs — and chemically related ones potentially under development — could have similar unintended consequences, causing side effects for patients. A schematic showing that some drugs that affect cell membranes also increase the range of proteins cut by rhomboid proteases. Researchers have discovered that three commonly used nonsteroidal anti-inflammatory drugs, or NSAIDs, alter the activity of enzymes within cell membranes. Their finding suggests that, if taken at higher-than-approved doses and/or for long periods of time, these prescription-level NSAIDs and other drugs that affect the membrane may produce wide-ranging and unwanted side effects. More positively, the researchers say, their work provides the basis for a test that drug developers can use to predict and perhaps avoid these side effects in new medicines they make. A summary of the results was published online in the journal Cell Reports on Aug. 21. Working with Syed Moin, then a postdoctoral fellow in his laboratory, Urban’s project began as an investigation into the role of the cell membrane in the activity of a group of “cellular scissors” embedded within it, known as rhomboid proteases. When rhomboid proteases cut proteins, the split proteins are released from the membrane. From there, half a protein might go on to signal to another cell or both halves might end up being degraded to prevent further functioning. It all depends on the jobs of the specific proteins that are cut, which are known to play roles in everything from malaria to Parkinson’s disease. Urban says they had already learned that rhomboid proteases have an unusual way of “deciding” which proteins to cut: They look for those whose structures are unstable. Since some proteins are inherently more stable or less stable, rhomboid proteases have certain “protein clients” that are more or less likely to be cut. Building on the fact that cell membranes provide some support to proteins embedded in them, Urban tried changing the physical properties of this “habitat” to see if alterations would change which proteins rhomboid proteases cut. He did that by treating human cells with two chemicals that either made the membranes more flexible or distorted their shape. As suspected, rhomboid proteases started cutting proteins they don’t normally cut, namely amyloid-beta precursor protein (APP) and the signaling protein Delta, while continuing to cut their standard “clients.” This suggests that the enzymes had lost their ability to discriminate between clients and nonclients, or that nonclients started acting like clients when the cell membrane changed, Urban says. Aware that many drugs end up in the cell membrane, Urban assessed the effect of certain drugs on rhomboid proteases’ ability to recognize their normal clients. Recent studies have looked at the ability of certain prescription-only NSAIDs to repair the function of gamma-secretase, another membrane enzyme that has more than 100 different protein clients, the most famous of which is APP. When gamma-secretase cuts APP at the “wrong” site, it generates a short protein piece that clumps in the brain and goes on to cause Alzheimer’s disease. According to those same studies, some prescription-level NSAIDs, like flurbiprofen, approved for treating serious arthritis, make gamma-secretase less likely to cut APP at the wrong site, but how they do so is unclear. If the drugs alter gamma-secretase activity by changing its habitat, the researchers thought they might have a similar effect on rhomboid proteases. So Urban treated the cells with flurbiprofen, indomethacin and sulindac at high but similar concentrations to those found in the blood of patients taking them at approved doses. 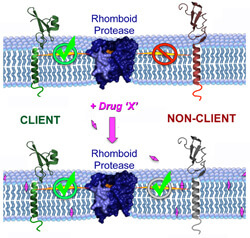 Rhomboid proteases again cut clients they shouldn’t, like APP and Delta, just as they had when treated with the membrane-altering chemicals. When cells were treated with NSAIDS sold over-the-counter, like aspirin, ibuprofen and naproxen, however, the range of clients cut by rhomboid proteases increased only slightly, if at all. To test the effect of the NSAIDs on cell membranes directly, Urban used an instrument that measures melting temperatures. Because membranes are composed primarily of fat molecules, heat can make them more fluid, like melting butter. In the same way that olive oil is a liquid at room temperature but shortening is a solid, the composition of molecules in the cell membrane can raise or lower the temperature at which it “melts.” A lower melting temperature means a more flexible membrane, and the researchers found that the same prescription-level NSAIDs that lowered the membrane’s melting temperature caused rhomboid proteases to cut nonclient proteins. One of the benefits of this study is that the researchers’ method can be used to test new drugs for membrane-altering effects. “Now we can use rhomboid proteases as predictors of a drug’s possible effects on the membrane and its enzymes,” says Urban. This work was supported by grants from the Howard Hughes Medical Institute, the David and Lucile Packard Foundation, and the National Institute of Allergy and Infectious Diseases (AI066025).